Militarism and the arms trade are harming us and our world. Arms exports fuel violence and wars, and new international arms races. One major event in the arms trade calendar is Eurosatory. These arms fairs are organised every two years in Paris and boast over 1000 exhibitors, including the major arms manufacturers and buyers from every continent. Eurosatory next takes place on 13-17 June 2016. Quakers have been conducting a vigil at Eurosatory for many years. However they are almost a lone presence. Unlike the huge opposition to DSEI in London, very few groups speak out at this event. The organisers of the Eurosatory peace witness are planning a visually interesting message to raise public awareness and encourage arms dealers to think about how else they could apply their technological and businesses skills. The arms trade employs very capable people; instead of preparing for war their businesses could be helping humanity meet the challenge of climate change and real security. 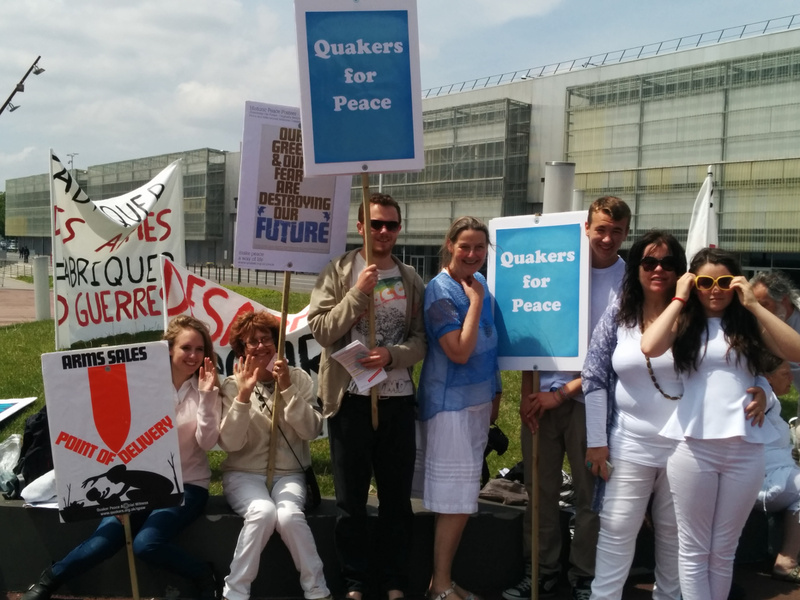 The Quaker group at Eurosatory 2016 hopes to open dialogue with individual participants, confident that some will converse with them as they did last year. Anyone is welcome to join the vigil at the arms fair next year, and can take part for the whole week or just a couple of days. Anyone interested in joining the vigil can email karinaknightartist [at] gmail.com. What has Eurosatory got to do with the EU? In recent years the European Council (heads of government from the 28 Member States) have supported measures to help to expand their arms industries, including ensuring the development of skills needed for the arms industry. The written conclusions from the December 2013 European Council meeting predicted that this would “bring benefits in terms of growth, jobs and innovation to the broader European industrial sector”. This argument is familiar: it is often made by arms trade lobbyists. However, this argument should not be used for a sector that produces tools for violence. It is inconsistent with the notion of the EU as a peace project. European weapons have been used recently against civilian populations in the Middle East and North Africa, and also further afield, in Sri Lanka and Colombia. Whilst EU member states have avoided war with EU borders, Europe is still fuelling conflict overseas for profit.